The academic journal reviews of Remembering the Battle of the Crater are just beginning to appear. Overall the reviews have been very positive. It’s encouraging to know that historians, who you respect, believe that the time it took to research and write was time well spent and that it constitutes a worthy addition to the broader historiography. I was surprised that the book review editor of The Journal of the Civil War Era asked Earl Hess to review my book given that he contributed a blurb for the back cover. Either way, it doesn’t get any better than receiving Hess’s stamp of approval in this particular journal. I am thrilled with his review. There are definitely some things I would do different if I had it to do over again. For one thing I would have done a better job of emphasizing the extent to which the 1903 and 1937 reenactments reflected the limits of sectional reconciliation. This would have situated the book more comfortably within a growing body of scholarship on Civil War memory. The Battle of the Crater, fought on July 30, 1864, as part of the third Union offensive during the Petersburg campaign, has drawn a good deal of attention in the past few years. Several books have been published dealing with the military history of the event, which now seems well covered in the secondary literature. 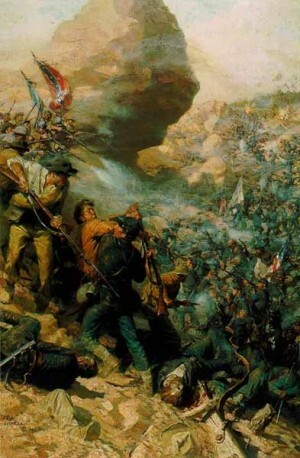 Kevin M. Levin, however, has written a study not of the battle itself but of how it has been remembered over the past 150 years, with a special emphasis on the controversial fact that a division of black troops participated in the attack that followed detonation of the mine that created the famous crater. Many of those troops were slaughtered in the counterattack that restored Robert E. Lee’s line outside the city, shot down in cold blood by enraged Confederate soldiers. Inspired by the growing body of literature dealing with the memory of the Civil War, Levin set out to use the Battle of the Crater as a case study of how racial issues played a role in competing memories of the war. Interpretations of the event, and the role of black troops in it, have been influenced by a variety of “political, social, and economic pressures” (2). For a long time there was a concerted effort to minimize the significance of black participation, dominated as memory was by a strident Virginia-oriented interpretation that gloried in the Lost Cause and in the hero of the battle, Confederate general William Mahone. The presence of black troops added an especially bitter degree of fear (many Confederates exulted in the fact that they “saved” Petersburg from plundering by bloodthirsty black Unionists) and an especially heightened sense of exultation that the Virginians of Mahone’s old brigade led the way in turning the tide of the battle against great odds. But Mahone himself became a controversial figure within the context of memory as well, because he “betrayed” the South after the war by forging a political union of whites and blacks to lead the Readjuster movement in Virginia. Clearly there is plenty of material in this story to unwind several strands of interest within the cultural history of Civil War memory. Levin has done a superb job of charting a course through the complex and sometimes perplexing details of this story. His research is exhaustive, and his critical eye encompasses such diverse elements as John Elder’s famous painting of the battle, the many reunions and reenactments held on the battlefield, the creation of the Petersburg National Battlefield, and the ways in which park personnel have tried to interpret the engagement to succeeding generations since 1932. Levin also has done his homework in consulting relevant secondary sources on everything from histories of family vacationing in America to military studies. His command of the relevant primary sources, both published and archival, is equally impressive. His command of what actually happened in the Civil War, in contrast to that of some historians who essay to write studies of memory, is sound and assured as well. One of the more important contributions of this book is that Levin takes the analysis thoroughly from 1864 to the early twenty-first century. He thereby allows the reader to see the full scope of change over time, highlighting the development of a vibrant black countermemory by the middle of the twentieth century. Blacks in small numbers had begun to educate white America about the military contributions of African Americans in the Civil War in the 1880s, but their voices largely failed to find an audience among mainstream Americans. After decades of dominance, the whites-only perspective was challenged by this countermemory so that today, as Levin expresses the point, it is not easy to ignore the multiracial character of the battle or of the war itself. Another significant contribution is Levin’s explanation for the slaughter of the black soldiers on July 30. He positions Confederate reaction to the presence of African Americans with guns in their hands within the context of slave insurrections in the antebellum South. For the Confederates who opposed black soldiers for the first time that day, it was Nat Turner all over again. The tone of Confederate letters, diaries, and reminiscences supports this view, which broadens our understanding of the battle’s significance not only in Civil War military history but in how the memory of the battle played out over the lifetime of surviving veterans. One could hope that Levin or someone else might turn attention to other salient battles involving black troops, such as Fort Pillow or Milliken’s Bend, to see if efforts to shape and reshape memory played out similarly to what happened after the Battle of the Crater. One also wonders about the implications inherent in the fact that black soldiers at times killed, or at least tried to kill, unarmed and captured Confederates (as happened, for example, during the Battle of the Crater). In fact, the other major ethnic groups involved in the Civil War—Native Americans and European immigrants—deserve some attention in this way as well. Amerindians fighting in the Confederate army scalped and mutilated Union soldiers on more than one field of battle during the war, incidents that have long remained relegated to specialty studies instead of mainstream analysis within the Civil War literature. More studies of European immigrant participation in the military side of the war, getting away from a mere chronicle of “what they did” and toward genuine cultural studies that take the story far beyond 1865, are also needed. If Levin’s study can inspire further work along these lines, its value will be enhanced beyond that of a mere case study, good as it is in that category alone. Having Hess review your must be quite an honor. Congratulations. On the matter of other battles involving black soldiers, I’d be interested in someone turning attention the the battle of Saltville. Thanks, Chuck. I couldn’t agree more. It’s mentioned in a number of studies, but I don’t know of any full-length book. I know that William Marvel has concluded that there was no massacre per se, although five wounded men were murdered. But Marvel seems to delight in going against the grain. Thomas Mays wrote a book on Saltville in the mid-nineties but I never read it. Great review. The book definitely deserves it. Really a fine piece of work. As always thanks for the kind words, Pat. It’s not possible to get a better review. Of course, it was well earned because it’s a fantastic book. Congratulations once again. Thanks, Brad. I suspect that its about as good as it gets. Congrats on the great review. Can’t wait to read this for myself. Previous post: Is The History of Gettysburg More Than a Collection of Facts?